If I am scrambling to get ready in the morning chances are I am going to put on something very similar to this! A button down of some sort with a vest has become one of my go to outfits and with good reason. Sometimes dressing for the weather here is incredibly tricky since when I leave for class it can be in the 30s and by the afternoon we are sweating in the 60s. Layering definitely works best for me so that I can shed as things start to heat up. My jacket of choice is always my Barbour and it has become such a staple in my wardrobe! By pairing a cozy flannel with a comfy vest and throwing on my jacket I have the ability to easily look dressed for the weather no matter what the temperatures decide to do. I'm going to have to put myself on vest restriction because I may or may not own 5 (only including puffer ones, oops) … I know it's bad but that is how versatile they are! If you don't already own one I am demanding suggesting you quickly add one to your Christmas list! I don't doubt that 2 (possibly 3) of my vests will be coming home with me for Thanksgiving since lately I feel like I don't know how to complete an outfit without them! (This is how majority of my outfit photos turn out…poor Nell for taking these). A vest is at the top of my list this year! I'm having a hard time deciding which kind I want - preferably something that I can wear for work & play! 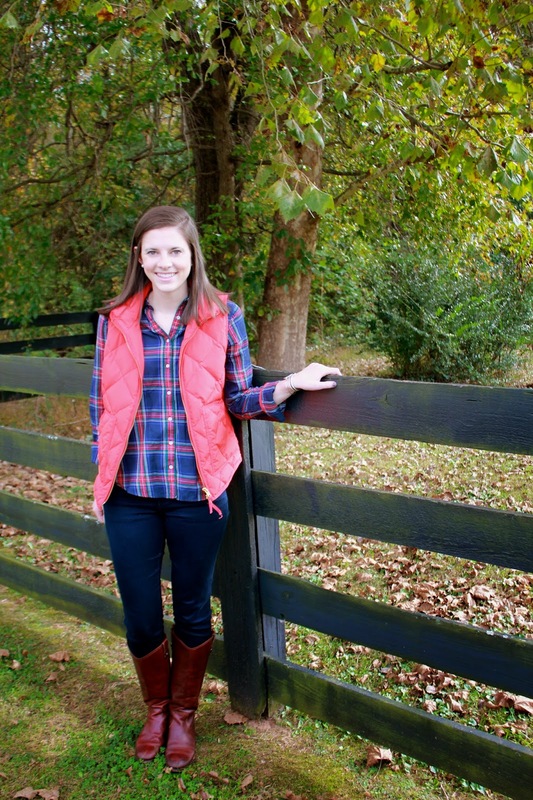 I love a plaid button up + vest- it truly is a staple look! 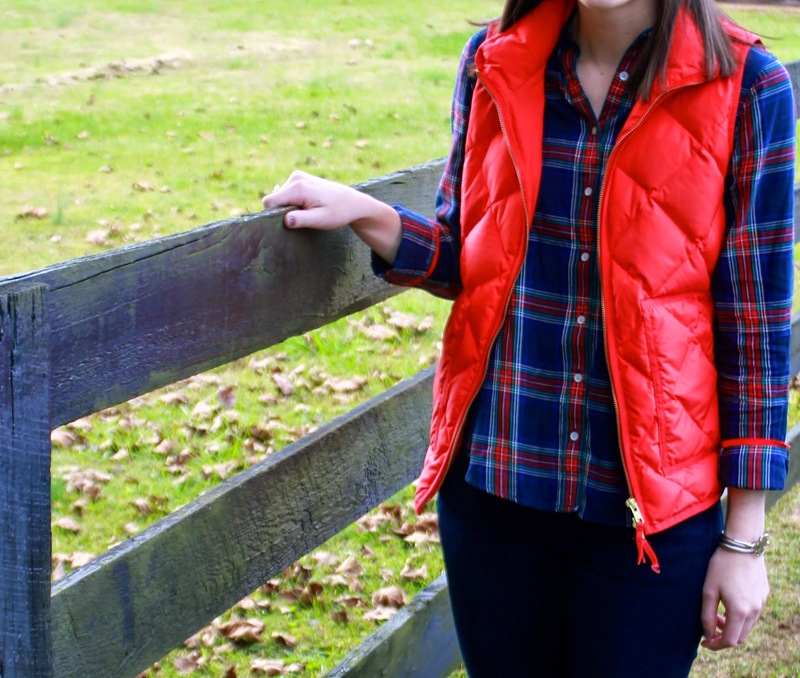 I have a major addiction to all of my J.Crew puffer vests lately too! My dad couldn't believe I was asking him for yet ANOTHER this year for Christmas! Great outfit picks! I'm a sucker for a puffer vest. I have two from J.Crew--the herringbone and navy and white stripes. It's amazing how many ways there are to wear them! 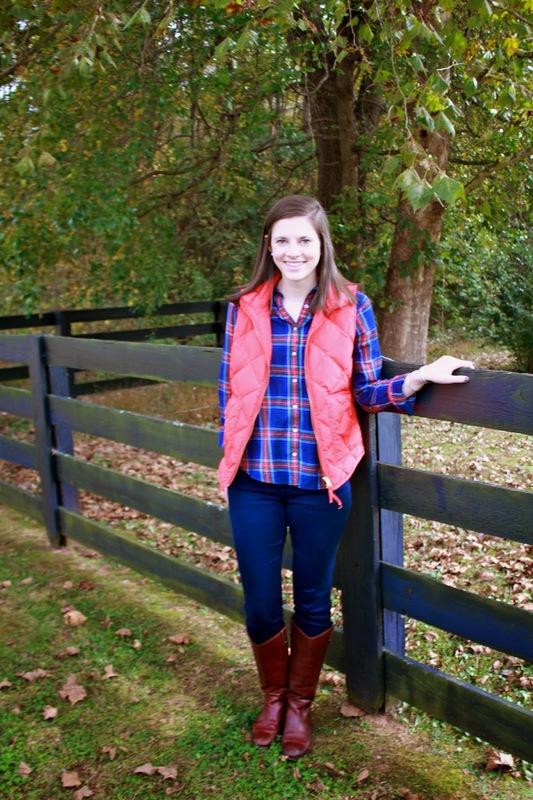 The JCrew Excursion vests are one of the best parts of fall/winter weather! I love mine, as well as some wonderful plaid flannels and knit socks. So great! Vests are everything! I love this post! 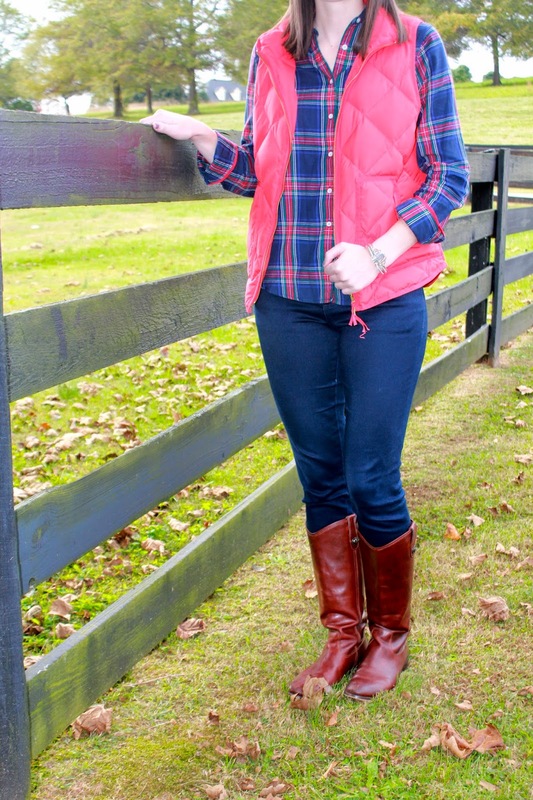 Vests are most definitely one of my go-to fall/winter necessities! I have been trying to figure out how to add the images of clothing that links to the website on my blog forever! How do you add them on blogger? Such a cute outfit! I haven't jumped on the vest bandwagon, but I think I need to pick one up soon! Love vests! I have two and I ware them all the time! Red is such a fantastic color for you! The J.Crew vests are just the absolute best. I can wear them with jeans or leggings, or I can ever dress them up over a dress! I didn't realize how much I would wear my herringbone vest, but I wear it so much-it's almost a necessity to buy some more so I don't wear that one all the time! Watch are on sale. Our products are popular all over the world with high quality, competitive price and fast delivery. Realize your luxury dream now! Breitling Watches Outlet Professional Replica watch Store, Where you can find your dream Watch easily at very low price including all world-renowned brands including Vacheron Constantin, Tissot, TW Steel and so on. Buy Hublot Replica Watches Online store to buy Replica watches, Replica Rolex, Replica Watches and Swiss Replicas. Here we offer all styles and models Watch you can find in the market at very reasonable prices.